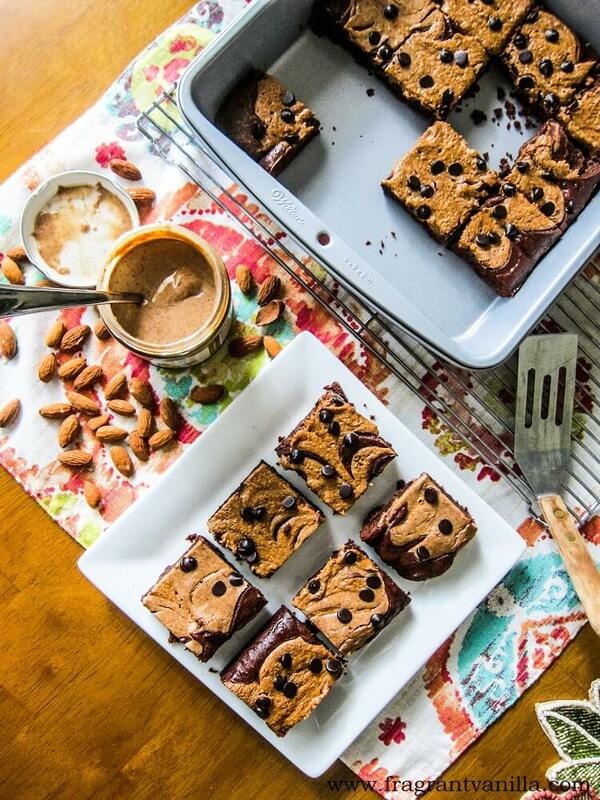 I wanted to feature the almond butter as the main ingredient this time! 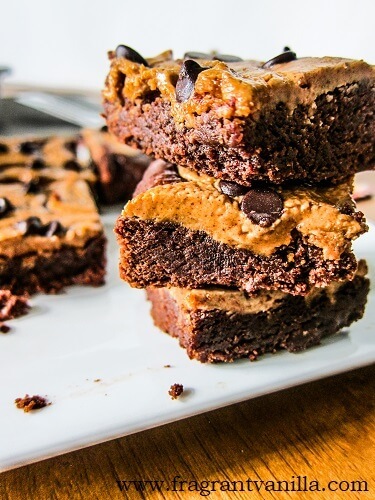 Why not, it is delicious, rich and creamy and I love brownies swirled with decadent things! I actually used some in the brownie base as well, because it makes for nice fudgy brownies. These are pretty simple to make, which I always consider a win. I made the batter gluten free, because I knew many of you would appreciate that, and honestly you don't notice the difference, they taste just as good as when I make brownies with wheat flour. The batter tasted so good! Brownie batter is one of my favorite things to lick from the bowl. It goes back to the days when my Mom used to make boxed brownies when I was little and I would always beg her to lick the bowl. It is one of the best parts of baking at home. 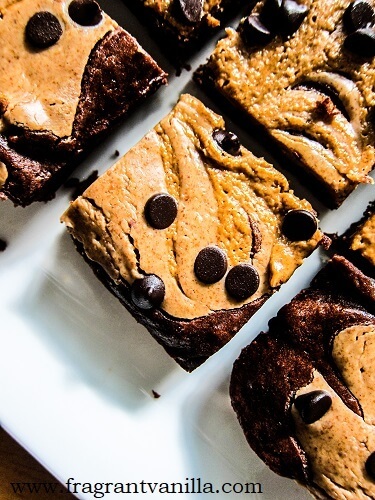 Brownie batter, cake batter, frosting, heck yes! 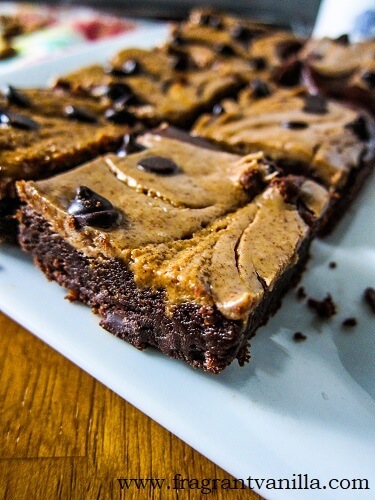 I stirred in vegan dark chocolate chips to make them even more delicious and swirled in plenty of almond butter since it was the star ingredient in these. They smelled amazing while baking. Nothing compares to the aroma of chocolate filling your kitchen and home. Also made me even more hungry. I couldn't wait to dive in, but I had to wait until they cooled It was worth the wait though! Total yumminess! The rich almond butter was the perfect thing to swirl into them! They were fudgy, rich, nutty, and it was hard to eat just one! 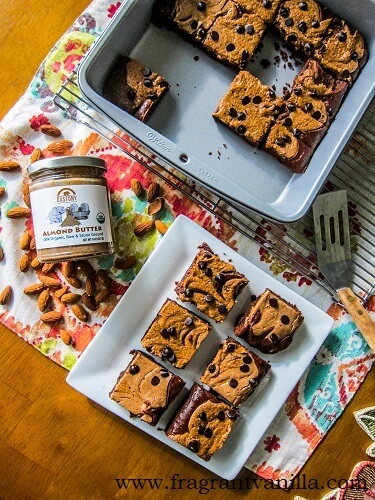 If you are an almond butter fan too, give these a try! Whisk together the sugar, oil and 1/4 cup of the almond butter until well combined and the sugar is starting to break down. Add the flax eggs and beat until smooth. Add the flour, cacao powder and sea salt and beat until smooth. Stir in chocolate chips. Scrape the batter into a greased 8x8 inch pan, then drop the almond butter over it in 2 Tbsp amounts, and swirl it with a knife. Amazing recipe explained by you, dear, I am going to share this recipe with all my family and friends.